JBS USA of Lenoir, N.C., is recalling approximately 4,922 pounds of ground beef that may be contaminated with extraneous materials, specifically shredded pieces of Styrofoam packaging. 2-lb. 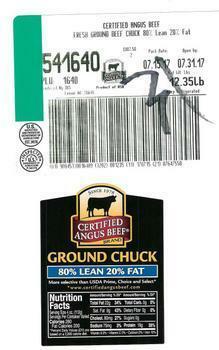 black Styrofoam plastic wrapped trays containing ground beef labeled “CERTIFIED ANGUS BEEF GROUND CHUCK 80% LEAN 20% FAT” with a production date 7/15/17 and case code 541640. The recalled product, bearing establishment number “EST. 34176” inside the USDA mark of inspection, was shipped to a distribution center in North Carolina for further distribution. Consumers with questions about the recall may contact Cheri Schneider, JBS director of external communications, at (970) 506-7717.